Today's classic film review, written by Roger Ebert, was originally published in the Chicago Sun-Times in 1967. In the review, Ebert debates the usefulness of a film hero. Paul Newman's portrayal as Luke gives the audience, and fellow characters, a difficult choice indeed. Is Luke worthy of admiration? In a few movies every year, the central character seemed to be rejecting the values of the audience and stomping on its sympathy. Not all the roles went as far as Brando's motorcycle hoodlum. But Rod Steiger's "Pawnbroker: was a pretty tough case, and James Dean's entire career descended directly from Brando's early style. Lee Marvin and Steve McQueen have made several apiece. Anthony Quinn is practically a professional unwashed anti-hero, although "Zorba" was an old-style lovable rebel. 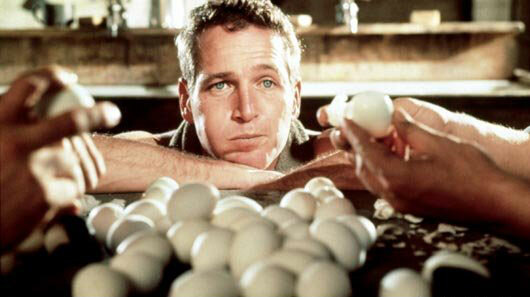 And then you have the case of Paul Newman.